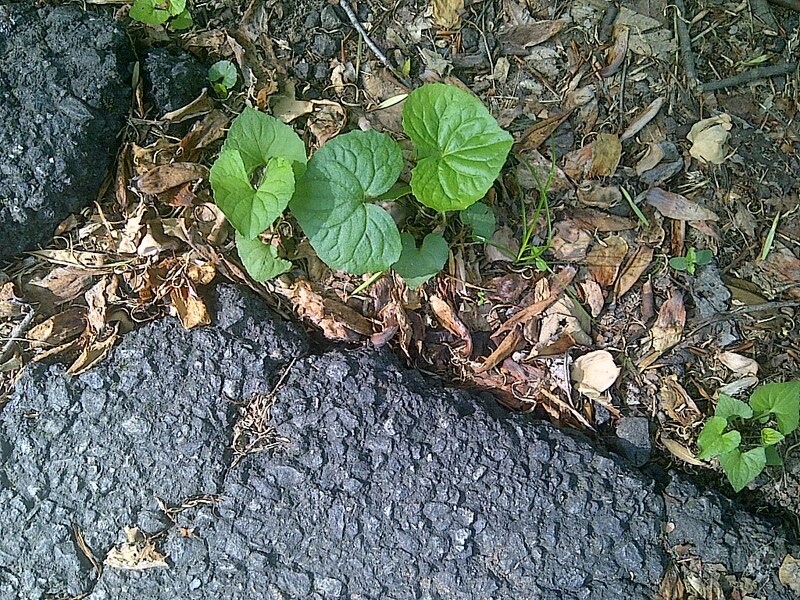 Seeing this Wild Ginger coming up in the broken pathway reminded me of this phrase. There are times in life when we wonder how we got where we are. Most times it’s the end result of our own actions. Occasionally, we are clueless. Either way, the only way to improve our situation is to make the best of where we are until we earn our way out, or until God allows us out. The way out is always the result of praise and gratitude. With gratitude comes a positive attitude. But praise comes first, not as a result. When we praise in faith, then our circumstances can improve, or our hearts will learn to accept that they won’t. The result will be praise that is felt from the heart. We may or may not leave the pavement crack for the company of a flower bed, but either way, with gratitude we will flourish. God Glimpses # 51 ~ What are your Chances? 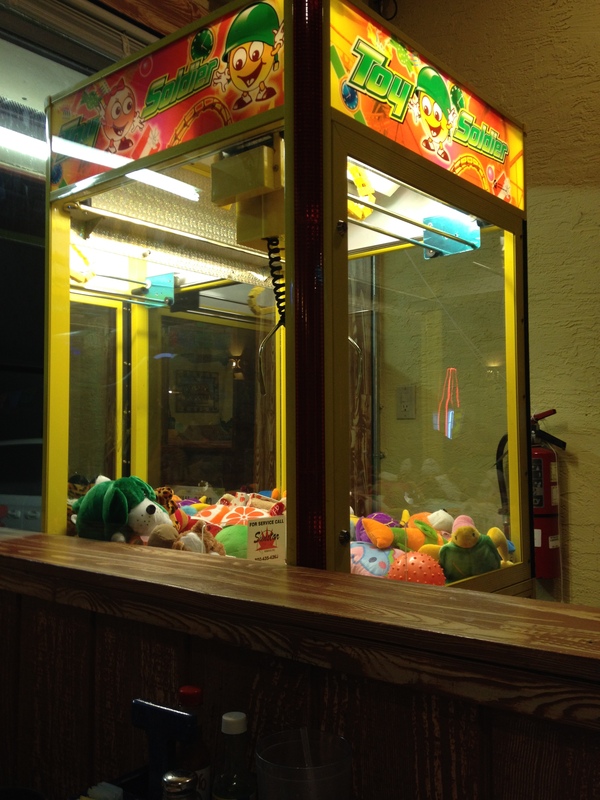 You’ve all tried these machines ~ or worse yet, had the lovely experience of watching your child come to grips with the odds of winning a prize out of these rigged monsters of greed. Relying on God’s promises isn’t a crap-shoot ~ it’s faith. Here’s what’s at the heart of faith ~ faith is the opposite of trusting in ourselves. The reason the world at large has such a huge problem with faith is that faith is the crucial issue of our existence. Are we going to trust in a being we can’t see to have all the answers to the problems that are bigger than we? There is too much we can’t solve, too many unanswered questions, too much everything. And yet, we all, believers and unbelievers, innately turn first to self-reliance. While all along there are answers and promises and instructions for all aspects of life the second we let go of self-reliance and simply refuse to play the losing game. It’s easy to look at the mess we’ve made as dead wood. Every year I have to cut the dead wood out of my Hydrangea. Every year there’s more. It’s a natural part of the life cycle of many woody shrubs and all trees. A certain percentage of the limbs and branches die off, and more grow in their place. Think of them as the equivalent of human hair. It doesn’t mean there is rot or disease, it’s just part of the process. Now take that thought and apply it to the mess you’ve made of your attempts. Is your life (and possibly your home and office) filled with the clutter and refuse of attempts that went awry or projects that didn’t make it past the planning stage? Don’t beat yourself up! This is a normal part of the process of growth. Rather than agonize over the failures, look at your mess as proof that you’re alive, trying new things, attempting to be and do more. Then get out the pruning shears and get rid of those things holding you back, reminding you of failure, and taking up valuable space in your life. Learn from God’s natural process. If you don’t cut out the dead wood, then the new can’t grow. There is no space, or light or air. Breathe in those wonderful life-affirming verses that you love, and then tackle just one pruning job today. Nothing brings hope for the future like new spring green growth. Make room for it in your life. “The thief comes only to steal, slaughter, and destroy. In preparing for our upcoming art show, “New Beginnings” the thought occurred to me that I might have other artwork lying around that could be used besides the paintings I’m preparing just for this exhibit. So I took a little tour around the house and came across this early painting. The subject was perfect ~ what says new beginning like the first adorable flowers of spring? Unfortunately, the paper was covered in foxing ~ those little or not-so-little rust colored specks that go right through the paper. It was polka-dotted with the ugly things. I got on the internet and looked up foxing and what to do to get it out of the paper. It all looked so complicated, and the only thing I had on hand was the bleach which was only one step in the process. Would just that first step do it? How much of the watercolor would fade? Was I willing to risk it for this one show? I certainly didn’t have time to get it back from a conservator before Friday. It was one of only two early watercolors I have left, and I’ve always been fond of it ~ it would grieve me to lose it. After the agony of deliberation, I decided to give it a try. After all, it was ruined as it was, and by the time I got it to a conservator, it might be too late to save it anyway. The foxing was already all the way through the paper. So I did it ~ I took the plunge. I prepared a pan of water with a small amount of bleach and submersed my darling little painting. After soaking for almost two hours, the stains were still there, so I left the studio for lunch, telling myself not to stay too long. At that point the colors were still strong. Of course you know I got involved in a book and forgot all about my little painting sitting in the tub of bleach solution. When I got back to the studio, the first thing that I saw were my little crocuses, just starting to bleed out purple. I rushed the painting to the sink and dumped the water from the pan, rinsing it while holding the painting, worrying about the bleeding watercolor. It was only a tiny amount, but it was clearly starting to run. I filled the pan with rinse water and gently floated the painting, flipping it over. I did it twice more with fresh pans of water. At that point the bleeding had rinsed away. How much of the color would remain once the painting dried? The drying process was accomplished with less stress, thankfully. You can see the result. The colors are once again as bright as when it was freshly painted, and the paper is truly white. There is no purple even though that’s how the photo appears. I’m not sure the camera knew what to do with those intensely purple flowers. I think you’ll agree that this painting has experienced its own New Beginning. One day we’ll be wearing white, and our true colors will shine. Until then, we take it by faith that our stains have been washed away. We have value and beauty and serve a purpose ~ each of us designed by the hands of the one who created us for his good pleasure. God Glimpses #47 ~ I was THIS Close! I was. I was this close to this alligator. Oh, I realize he wasn’t a really big alligator, but I was still this close. I took this picture with my iPhone, no telephoto lens involved. He could’ve reached out and chomped off my arm in a heartbeat. But he didn’t. In fact, he didn’t even flinch. He blinked a few times, but he kept staring at me with those reptilian eyes. Maybe it had something to do with the thick glass between us at the aquarium. Yeah, I’m sure that was it. Because he did look like he would like to chomp off my arm. Don’t we sometimes tempt temptation like we had aquarium glass between us and it? Na-na-na-na-na! You can’t get me! He’s waiting to get you. Don’t give in. Put out your hand and feel the glass. God’s got you. Crowns! The Usurper will NEVER have even one ~ and yet, as CHILDREN of the KING we are entitled to qualify for several ~ each! Millions of crowns, and the pretender to the throne gets none. How’s them apples? That garden thing didn’t work out too well, did it? The King of gratitude defeated bitterness before the world was formed, and then he showed us how to obtain the crown of righteousness by living in thankful surrender. It started when he was about to turn forty-five. He’d aged enough, and didn’t see any point in getting older. Forty-four was old enough. As long as he could stay forty-four, he would still be young enough to . . . whatever. Don’t tell my dad, but he’s added forty years to that number. You’d never know it. He still works twelve hour days, just not five in a row. He still thinks young and looks terrific for his age, even if he’s not working forty-four hours a week any longer. Days like today I wonder how he does it ~ days when I wake up feeling one hundred. Seriously? It gets worse? I don’t even want to think about it. So, like Dad, I get out of bed every morning, and have a talk with my heavenly Dad. It might take a while of waiting on the Lord, but soon I’m feeling forty-four again. Waiting and Patience ~ as much as I don’t like those words, they keep coming up again and again. I have to keep forgiving myself and forgiving others and learn all over again that no matter how many times we fail, He never does. His strength is made perfect in our weakness. I’m slowly learning to enjoy these times of weakness, just to see what God will do above and beyond my best efforts. PLAN, PRIORITIZE, and TRACK your New Year! The app is called Priority Matrix. I have it synced on my phone and tablet. (Free there, but costs on the computer.) Put in a master list, a weekly list, and a today list. Divide the master list into Urgent, Important, Obligations, and Eventually. (Keep in mind that only if the item is important to you and a true obligation does it belong in urgent, unless it’s unavoidable, like taking your kid to the ER) This also helps you resist volunteering yourself for things you can’t really do. The This Week and Today lists are divided into whatever categories your life takes. Right now mine is journals, home, art & writing, nonprofit & church. Another great time management tool is an app called Hours Tracker. Great for tracking the time you spend on projects. Very versatile. Keeps me focused when I know I’m on the clock, and helps tremendously with putting a value on my time. This box just happens to be my travel watercolor kit. I searched and researched and am thrilled with my choices of supplies. In fact, this works so well that I seldom use my large watercolor palette or even my expensive Kolinsky brushes. Simply squeezing more water into the tip of a Sakura brush is faster and wastes less paint. The purchased watercolor kit within my kit isn’t the most expensive, in fact it’s one of the least expensive on the market. The great thing is that the watercolors are standard half-pan size, so when I want to replace a color, I can buy just one of any number of brands. The whole kit is a tiny bit of perfection. No matter what you do for work or for fun, you understand the joy of having the right tools for the job. No struggling to make do, no wishing you could have the top of the line because what you have is already the best for you, even if it’s not the most expensive or the most popular. Every single time my eyes land on my little box of joy, I smile. For me, it’s perfect. Perfect cat footprints on velour blanket while bed making, watching–fuzz springing up, velour returning upright, leaving only the memory of an impression–God glimpses in the daily. Holding impression in my mind to carry me through the day. I see God, feel God, whispering.